United Natural Foods Inc. reports net sales increase in Q4 and fiscal 2018, but gross margin and net income fall on Whole Foods sales. United Natural Foods Inc., a leading distributor of natural foods, saw net sales reach a record $10.23 billion for the fiscal year that ended July 28. The year-end figure was an increase of 10.3 percent from fiscal 2017. Whole Foods accounted for 36.7 percent of UNFI’s net sales in fiscal 2018, according to the earnings report. Sales to the nationwide chain, which Amazon purchased in June 2017 and closed on two months later, grew 21.4 percent. Independent sales increased 6 percent and supermarket sales rose 4 percent. Fourth-quart er net sales increased 10.7 percent to $2.59 billion. Whole Foods Markets’ sales increased 27.5 percent from the fourth quarter of fiscal 2017. Year-long growth in supermarket sales slowed, though, to 1.1 percent compared to the previous year’s fourth quarter. However, the grocery distributor’s net income and gross margin both fell compared with the fourth quarter of 2017. Net income dropped 15.6 percent to $32.79 million in the fourth quarter, UNFI reported. Gross margin was 14.5 percent, 1.25 percentage points lower than it was in Q4 of fiscal 2017, a change that Chief Financial Officer Mike Zechmeister said was disappointing. He explained that the decrease had two causes: A rapid increase of sales to Whole Foods, a low-margin retailer, and the rising cost of inbound freight. Sales to Whole Foods carry a smaller profit margin than sales to other retailers. Because those sales grew faster than sales to independent stores and supermarkets, the total gross margin fell. Whole Foods’ increased sales accounted for about two-thirds of the drop in gross margin, according to company officials. The cost of inbound freight—getting product from suppliers to UNFI distribution centers—increased faster than UNFI officials expected. Diesel fuel costs rose 2.9 percent or 8 cents a gallon since the third quarter of fiscal 2017. The distributor will recoup the expenses in the first and second quarters of fiscal 2019 because transportation increases are passed along to customers. UNFI was “overly optimistic” about the rate of increasing inbound transportation costs, Spinner said. Increased demand for products prohibited the company from negating the rising costs in just one quarter. In July, Spinner announced that UNFI would acquire Supervalu, a competing distributor, for about $2.9 billion, including the assumption of debt. The transaction is expected to close by the end of the calendar year, and UNFI wil l sell off Supervalu’s remaining retail stores. “The opportunity to bring these to companies together is really unbelievable,” Chief Operating Officer Sean Griffin said during Thursday’s earnings call. The transaction will benefit customers, associates and long-term stockholders, he added. UNFI expects to see $175 million savings through cost synergies during the third year following the acquisition, and $185 million savings the following year, Spinner said. But the combined company will benefit existing customers of each distributor, as well, he said. “This is a game-changer for us and for our industry. The acquisition will help us better meet the needs of our customers,” Spinner said. The expanded business will be the country’s biggest natural and organic wholesaler and its second-largest food wholesaler, UNFI reported. It expects to have more than $20 billion in net sales, supplying about 45,000 customers and offering about 250,000 SKUs as well as nearly 6,000 private-label SKUs. Also, UNFI will operate at least 60 distribution centers throughout the country. Supervalu owns properties in several states where UNFI does not: Montana, North Dakota, Illinois, Virginia, Mississippi, Alabama and Florida. 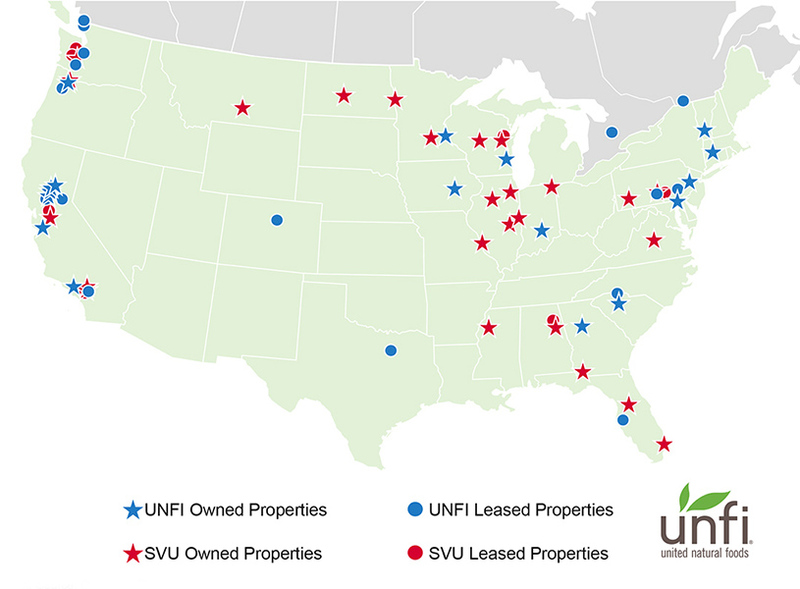 Along the East Coast, in the Pacific Northwest and in California, UNFI owns or leases more properties than Supervalu, UNFI reported. With the additional distribution centers, UNFI will be able to deliver high-demand products and high-value services—including promotions in the front of the store and administrative programs behind the scenes—as well as a wider variety of products, both fresh and packaged, Spinner said. 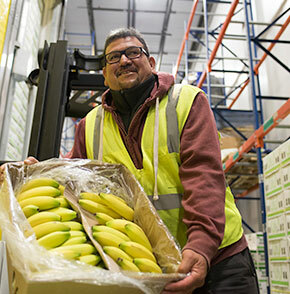 “We are really, really excited about this transformative transaction to create a new and stronger business, the leading and premier food wholesaler and distributor with significant reach, and choices for customers old and new,” Spinner said.